Today, August 29, 2003, Mars Global Surveyor (MGS) completes its 20,000th orbit since the start of the mapping phase of the mission in March 1999. Each of the 20,000 nearly-polar, nearly-circular orbits around the planet takes about 2 hours. The spacecraft passes over each martian polar region twelve times a day. 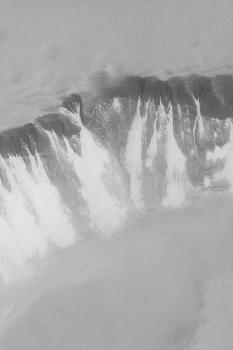 This July 2003 MGS Mars Orbiter Camera (MOC) image shows defrosting gullies and mass movement (landslide) features in the south polar region. This is a springtime view; all of the carbon dioxide and water ice that accumulated on the ground during the previous winter is subliming away. The different physical properties of the ground beneath the frost leads to differences in the length of time that a particular surface retains frost as spring progresses. Here, the areas that still have the most frost are the bright features associated with gullies and landslide deposits. These deposits may contain more sand than their surrounding terrain---we know from images of martian sand dunes that frost tends to linger a bit later in the spring on a sandy surface. This image is located near 70.7°S, 358.2°W. The slope bearing gullies and landslide materials is facing toward the bottom/lower right. Sunlight illuminates the scene from the lower right. This image covers an area 3 km (1.9 mi) wide. Malin Space Science Systems and the California Institute of Technology built the MOC using spare hardware from the Mars Observer mission. MSSS operates the camera from its facilities in San Diego, California. The Jet Propulsion Laboratory's Mars Surveyor Operations Project operates the Mars Global Surveyor spacecraft with its industrial partner, Lockheed Martin Astronautics, from facilities in Pasadena, California and Denver, Colorado.